During today's Nintendo Direct in Japan, it was confirmed that a new Professor Layton title will arrive on 3DS, in Japan, some time in 2013. 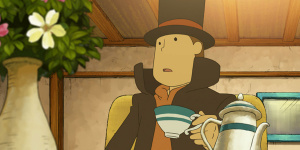 Its title is Professor Layton Choubunmei to A no Isan, which roughly translates to Professor Layton and the Remains of an Advanced Civilisation, though we expect a snappier title when it's localised in the West. The footage shown demonstrated the usual mix of attractive cut-scenes and puzzles, with a charming looking 3D-engine replacing the 2D characters of the DS titles. The biggest bombshell was that this will be Hershel Layton’s final adventure, though it's not certain that it means the end of the franchise as a whole. Will this title see the apprentice Luke take over from the master, or someone new? We certainly hope that we'll see more of these games beyond this release. Those of us outside of Japan may need to wait a while, but does more Layton on 3DS get you excited? It'll will be a very sad day if it is the last ever Layton game in the franchise. I never got into the Layton Series, but it possibly ending is a big deal for some people. My friend loves them, i know she will be sad to find out about this. I should probably pick up The Last Specter and get in to the second trilogy before The Miracle Mask gets released. Oh, and it's been known for a while that this is the last Layton game...of the second trilogy. Interesting that they've gone for a 3D engine. I didn't see the broadcast but I'll look out for some footage. Hopefully it retains the feel of the 2D art. Does anyone have any suggestions? Whom ch is the best professor Layton game with the most content as of now? All you need to do is look for footage of The Miracle Mask. That game uses a 3D engine as well. It isn't new. I was under the impression that this game would be the final adventure of the prequel trilogy, and then the focus would return to post Unwound/Lost Future. That's my sincere wish. Maybe the newer games won't feature Layton, but will have Luke as an adult. You spelled "civilization" wrong. Unless, of course, that's how it's spelled in other countries. Does this being the final adventure mean that Layton vs Wright will be released first? Argh, they left the ending of the 3rd game open for another game set after the first trilogy. I don't think level 5 have the financial guts to stop making Layton games. Perhaps the series could use a year break before they start another trilogy though. And I seriously doubt they'd even consider really removing Layton from the games. Perhaps they're trying to set up the next game as a mystery where Layton goes missing and Luke needs to track him down or something. @A-Hungry-Banker "It'll will be a very sad day if it is the last ever Layton game in the franchise." <- AGREED! I haven't played ONE of these games Someone that played these games want to give me a brief description on the series and what the gameplay is like, I'ld appreciate it Pretty interested in this series though, new game certainly sounds interesting. How could it end? Nooooooooooooooooooooooooooo!!!!! Luke taking over, you say? Apprentice Luke and the Baseball Predicament! I doubt this will be the last! It's highly profitable! I don't know if I'll play it forever, though! I'll still like it, I'll buy number 5. But it might get stale someday! By the way: What happened to the mobile phone game that stars Layton's son? Is there still any chance of that appearing on a Nintendo device? And then there also seems to be a proper Professor Layton mobile phone game. Something with a mansion and a deadly mirror. Again: Will we see it someday on a Nintendo device? Too bad that it is ending, but this kind of game needs an ending at some point. I can't wait to play the final two games. I, being the fan of the series I am, was really looking forward to a sequel to the Unwound Future. Now, I'll just have to think about why this series had to come to an end so soon and why Level-5 doesn't want my money. @19Robb92: Ah cool - it looks pretty neat, actually. If only I had a 3DS! I'd like to let all of you know that the series may be coming to an end, but it's been said that spinoffs can be expected. EDIT: Sorry that the link isn't working. Copy and pasting it in the address bar should work however. @Prof I am sorry for you. And all of you @Layton fans.